How big is Proxima Centauri b? How Big Is Proxima Centauri’s Planet? Artist’s impression of Proxima Centauri b. 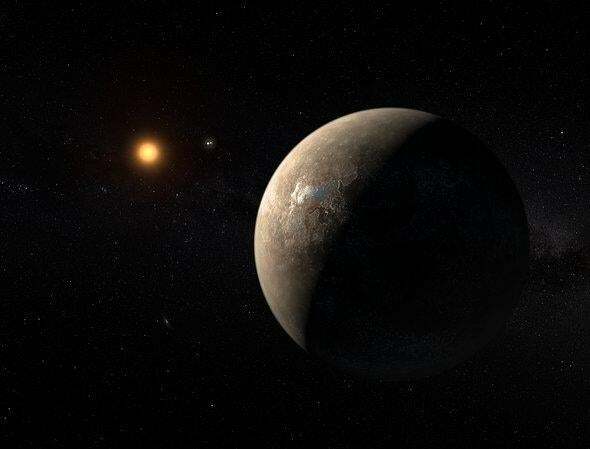 Earlier this year, astronomers announced amazing news: The closest star to the Sun, called Proxima Centauri, has a planet! Not only that, but the planet’s size is roughly the same as Earth’s, and at its distance from Proxima it gets about the same amount of heat as the Earth does from the Sun. In other words, we’re looking at a potentially Earth-like planet. Potentially. The problem is that we don’t really know how big the planet is; and I mean that literally. Its diameter is unknown, and we need that to get any kind of understanding of what the planet may be like. Why? Because if the planet (called Proxima Centauri b, or just Proxima b) is small and massive that means it’s dense, and so is will probably be composed of mostly metals and rock. If it’s large and massive it’ll be far less dense, and could be rocky with lots of water. Somewhere in between means it could have the same overall composition as Earth. These are three very different outcomes, and they all depend on the planet’s size. My friend Ian O’Neill has a good article outlining this. The only way we know to measure the physical size of a planet is if it transits its parent star; that is, the orbit of the star is edge-on as seen from Earth, so we see the planet pass in front of the star once per orbit. When it does that the star’s light drops a bit, and the amount it drops depends on the size of the planet: A big planet blocks more light than a small one. If we know the size of the star (and we generally can determine that) then the amount the light dips tells you the size of the planet. Knowing this, some astronomers observed Proxima using the Microwave and Oscillations of Stars Telescope (or MOST), a ‘scope with a 15 centimeter mirror that orbits the Earth. MOST is tiny; it only has a mass of 53 kg (that’s less than the mass of a typical adult human) and has a relatively small mirror, but being in space means it’s very stable. It doesn’t have to worry about peering through Earth’s atmosphere, which is wiggly and wavy. That means even a small ‘scope can make very precise measurements of a star’s brightness. They observed Proxima for more than 40 days, looking for any tell-tale dip in its brightness. And they found one! Better yet, it was about what you’d expect from a planet the size implied by Proxima b’s mass. But the problem is the data are a bit noisy, and the transit inconclusive. 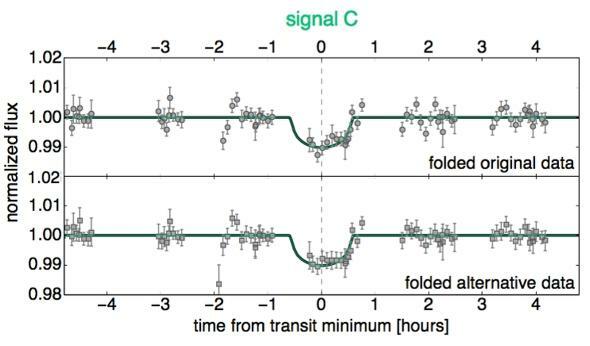 It’s possible, even likely, it’s just a statistical fluctuation in the data, and so in the paper they say the odds are actually against the transit being real. That dip is just what you’d expect from a planet … but also from random fluctuations in the data. Drat. That’s disappointing. But not really unexpected; if the planet is roughly the size of Earth, the orbit has to be almost exactly edge-on for us to see a transit. Even a small tilt means it would appear to pass above or below the star from our viewpoint. The chance of a transit was only expected to be about 1.5 percent anyway. By the way, that tilt affects the mass we find for the planet, too. The planet’s existence was found because as it orbits Proxima, it pulls on the star with its gravity. While the planet makes a big circle around the star, the star also makes a smaller circle. We call that reflexive motion. The more massive the planet, the bigger the reflexive motion of the star. As a planet orbits its star, the star moves, too. In the research that found Proxima b, they found the likely mass of the planet is about 1.27 times Earth’s. But that depends on the tilt of the orbit! If the orbit is edge-on we see the reflexive motion maximized; if we see the orbit face-on we won’t see any reflexive motion at all. So the mass we find is the minimum for the planet; it could be larger if the orbit is tilted. The thing is, at around twice the mass of the Earth, a planet starts to look more like Neptune than our fair world. It has enough gravity to accumulate a thick atmosphere, and would not be Earth-like as we think of it. So knowing the exact mass is important. And we don’t know it. But there’s hope. As the paper authors point out, observations in the infrared, light outside the range our eyes can see, would help. Proxima is several hundred times brighter in the infrared, making the observations easier. Also, like many red dwarfs, Proxima is a flare star, blasting out huge stellar storms due to its magnetic activity. That makes observing it very difficult; it keeps changing its brightness, and that interferes with planet transit hunting. But in the infrared flares are much dimmer, again making it easier to observe there. Mind you, the odds of Proxima b actually having an orbit that allows it to transit are long. But not zero! I think it’s worth a big infrared telescope’s time to look for a transit. This is, after all, the closest known planet in the Universe outside our solar system. I think it’s a good idea to get to know our neighbors.